A quality pizza peel makes cooking pizza infinitely easier. The pizza peel or paddle is the best way to get your pie in and out of the grill. 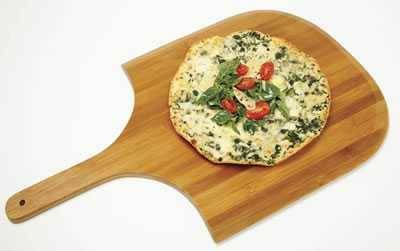 While they are available in metal and wood, we prefer a wood one such as the New Star Foodservice Pizza Peel. To use, simply dust the top with flour or corn meal, which acts like ball bearings and adds nice flavor and texture. Then you spread the dough on the peel, top it, and slide it onto the pan or stone on the grill. It is important to not let the wet dough sit on the flour on the peel too long when you dress the pie or else the flour will get wet and glue the dough to the peel. That's why I prefer corn meal. It doesn't get wet easily and makes bigger ball bearings. You then use the peel to remove it. They come in all sorts of sizes and prices, metal and wood. I prefer wood for inserting the pie, and metal for turning the pie. Wet dough tends to stick to metal and makes it a little harder to slide off. Prices vary greatly based on size and construction, from about $15.00 to about $30.00.